Drake's® Devil Dogs are an original. Two classic, fun-shaped devil's food cakes, sandwiched around an abundance of rich, Drake's vanilla-flavored creme, first introduced in 1926. The time has come for a companion product worthy of the Devil Dogs name. How do you improve on a consumer favorite with over nine decades of deliciousness? "Dip it in fudge, of course," Chip Stenberg, Drake's associate brand manager, said. "We've got the research to back it up, but, hey, it's just a fact." Drake's Fudge Dipped Devil Dogs® will be available in supermarkets, supercenters, value retailers and convenience stores throughout the Eastern U.S.
A product locator search function will be available to consumers at drakescake.com. 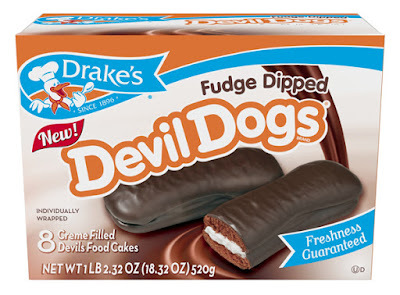 As with all Drake's cakes, Fudge Dipped Devil Dogs are certified kosher by the Orthodox Union. Consumers can look for the circled-U symbol (hechsher) on the cartons. Drake's founder, Newman E. Drake, established the brand in 1896 selling sliced pound cake in New York City. Now a part of the McKee Foods family bakery, Drake's cakes are high-quality products that are baked fresh and delivered directly to neighborhood stores throughout the Eastern U.S. More information is available at drakescake.com, on Facebook at facebook.com/drakes and on Twitter at @drakes.